I have been searching for a cute tank pattern for a while. I have been debating on the wiksten tank but from the ones I have seen produced, wasn’t certain that would be a flattering pattern for me. Enter the Tiny Pocket Tank. I starting following Sew Caroline on Instagram a while back and love all the TPT versions that she has sewn so I decided to take the plunge. By the way if you need any selfish sewing inspiration, she is amazing! 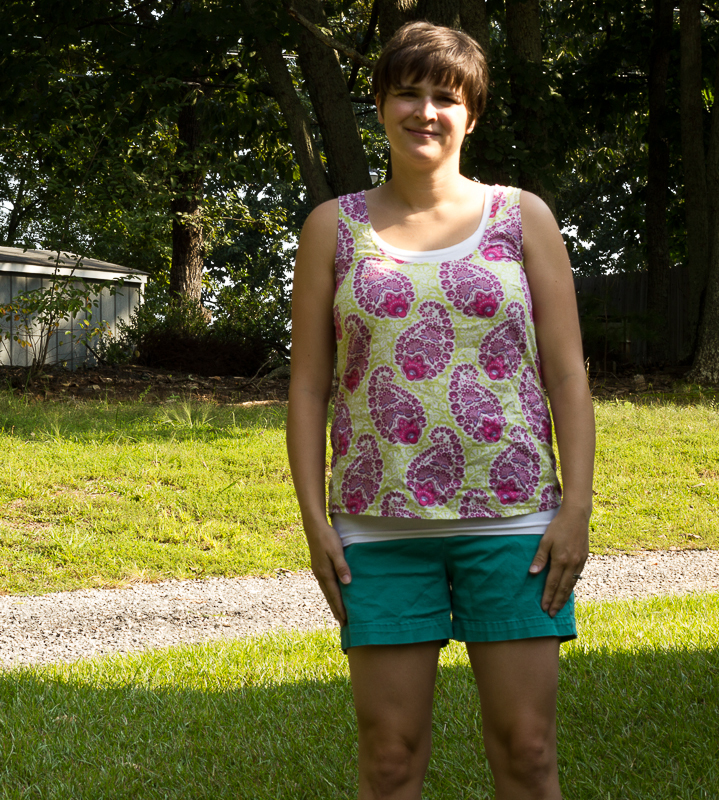 The Pattern: Tiny Pocket Tank from Grainline Studios. Highly recommend Grainline Studios Patterns after trying two of them. (Review of Maritime Shorts pattern here.) I really want to try the Archer and Lakeside Pajamas patterns also but am resisting the urge to buy more patterns right now. We shall see how long my self-control lasts. Fabric: A Joel Dewberry Voile I picked up for ridiculously cheap at a fabric sale. I have determined voile is the perfect fabric for the tank! I only wish I had more voile because I want to make a ton more of these tanks! I have worn this one almost non-stop since making it! Other comments: I made a size 12 based on my bust measurements. I recently bought some Swedish tracing paper (Amazing stuff, my friends!) and used it as my muslin. When I did, I realized that the back would gap at the top and the sides were too billowy. But thankfully the bust darts were good. When I cut out the shirt I moved the back pattern piece over 1 inch, angling down to be even with the fold line at the bottom and that made the top perfect. I took in the sides a bit as well- basically graded them down to a size 8 at the bottom. It’s not perfect, but it works. I am still learning how to fit myself up top and could really use a class in that!! Wishing we had someone in town who taught classes like that…so jealous of those living up in Ann Arbor and attending all the cool classes at Pink Castle Fabrics’ new digs!I see myself making quite a few more of these tanks to wear under cardigans this fall! Hopefully I will get the fit even better with the next ones. 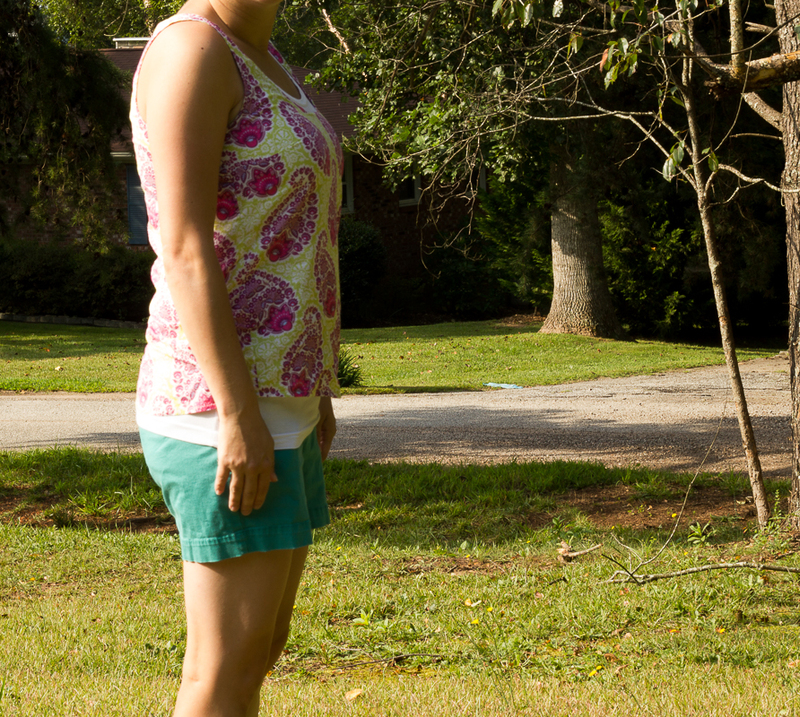 This entry was posted in Clothes, Selfish Sewing and tagged grainline studio, handmade tank top, tiny pocket tank by oliver's fancy. Bookmark the permalink.